Chelsea La Qua was born and raised in Flagstaff, Arizona. She moved to Phoenix to attend college at The Art Institute of Phoenix, where she obtained her Bachelors in Media Arts and Animation. 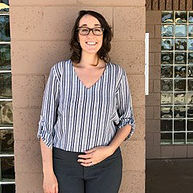 While her personal education did not lead to teaching, Chelsea’s administrative experience allowed her to be part of the Arizona Schools for the Deaf and Blind, where she served as an Administrative Secretary for the Early Childhood Intervention team. Here she assisted in providing new parents with the tools needed to overcome the challenges of their child’s hearing and/or vision impairments. It was after seeing just how vital these services were to these families that she knew she wanted to be part of an organization that would make a change for the better in her community. She now works as the Executive Assistant at Read Better Be Better, where she is thrilled to be a part of the amazing work that Read Better Be Better does to help Arizonan children become confident readers and more accomplished students. As an avid reader herself, she values the positive impact a love of reading has on the enjoyment of learning and development of skills to be successful in life. Chelsea lives in Phoenix with her husband John and son Michael. She also has 2 dogs, Moses and Max, and a cat, Mushi. She spends her free time working on artwork, learning new crafts, home improvement projects, or spending time outdoors hiking, fishing and camping.